The rod boasts a fairly amped lower half and has a deceptively low swing weight. As per Winston: the NIMBUS sports a progressive-fast action. My overall impression of the NIMBUS (as well as Winston’s previous two all-graphite offerings), is that it is the leaner and meaner cousin of the well-tempered Boron family of rods. 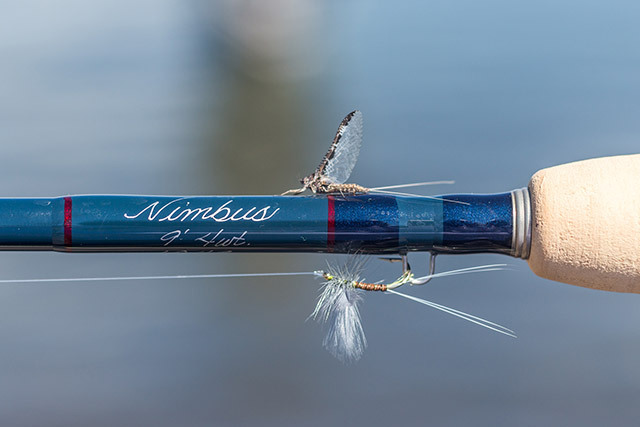 Power, without control, yields unremarkable results, and because of the NIMBUS’s low swing weight, the rod demands that you put a little more muscle into your cast. Control is pretty much integrated in the blank, with virtually no post-cast wobble to speak of. If sharpshooters have their weapons of choice, this would be the corresponding fly rod. NIMBUS rods are imbued with significantly more power than previous—graphite—generations. I tested the 4-weight configuration that handled a Scientific Anglers MPX line with ease (note that I only over-line rods for testing purposes and generally recommend that anglers stick to corresponding line sizing). I also tested the NIMBUS with a standard #4WF and #4DT line and noted that the blank delivered both lines with uncompromising accuracy. Casting requirements, check. Loop stability during roll casts, again, with both lines, was excellent and could be executed with both authority and precision. The characteristic that is sadly lacking in too many fast fly rods is fish-playing flexibility. It’s the factor that separates mere casting tools from fully-thought-out, -designed and -crafted fishing implements. To truly enjoy landing a fish, a fly rod must be able to communicate all of the unseen underwater activity. Takes can be ultra-subtle, fish can decide—often in an instant—to become uncooperative. The NIMBUS sports somewhat of a “nervous” blank, giving you a fine feel for anything that might be interested in your offering. And when comes time for putting the brakes on fish with plans that don’t correspond to yours, the NIMBUS also offers enough spine to assist you in getting the job done, and quickly. If you’re beginning to get the impression that the NIMBUS is one of those increasingly rare all-rounders, you are correct. As expected, the rod excels at launching weighted streamers as far as you need to reasonably get them. Most impressively, however, is that the rod can also easily address every manner of finesse situation, like laying out a 22-footer, with a 7x leader that’s topped off with a #24 Invisible.